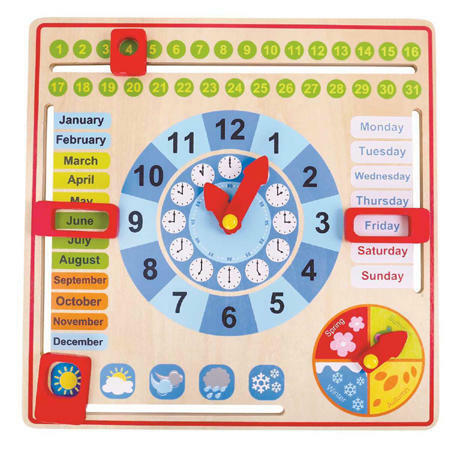 Date Time Weather Wooden Calendar is an educational learning toy which will help your little one understand months, seasons, days of the week, dates and time. The centre clock has movable hour and minute hands as well as little pictures showing clock face and hand positions. There is a dial showing seasons and a slider for weather types, days of the week, months and date. A very well made and designed toy all the numbers etc are painted directly onto the wood so there are no stickers to peel off. We like this because: "Great way to help a child understand the passing of time and the length of weeks and months." The toys are great. Delivery was prompt. I will be purchasing more from wooden toys in the future.